Christian monograms: the ichthys, crosses, crown and psalms and the cross on globe occur with varied forms and designs on both faces. George Brooker of this town guided the whole and assisted with the flat colouring. Mr John Booth supplied the Artists’ colours and best leaf gold at cost price. James T. Lynn engrossed this and Douglas Y. Blakiston designed the illuminated border. 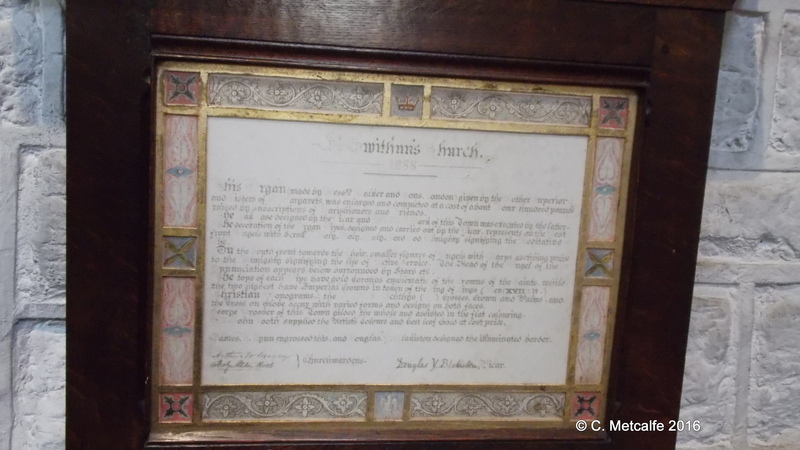 Arthur St Tracey, Evelyn Alston Head, Churchwardens. (with apologies if I have misread any of the names). The Book of Revelation has a reference to the King of Kings in Chapter 17, verse 14. The Ichthys or Ichthus is the symbol of 2 intersecting arcs which make a fish shape, used as a secret sign by early Christians. In days gone by, the ‘Makers of Musick’, including perhaps a flute, clarinet, fiddles, bass viol, basson and oboe, would have played in the gallery. It seems that the congregation, in their box pews, would turn towards the gallery for hymns and psalms. In 1825, a barrel organ was purchased for St Swithun’s and installed in the gallery. The choir and schoolchildren would sit either side of it. The barrel organ played 30 sacred tunes and cost £210. A further 14 guineas were spent on another barrel which played the Hallelujah Chorus and Coronation Anthems. The Rev’d Charles Walter Payne Crawfurd moved to the parish in the 1860s and collected funds for a new organ, a finger organ, not a barrel organ. This came from Bevington and Sons, London, cost about £130 and was installed against the north wall. It was moved in 1878, during the refurbishment of the church by the Vicar, the Rev’d. Douglas Blackiston. 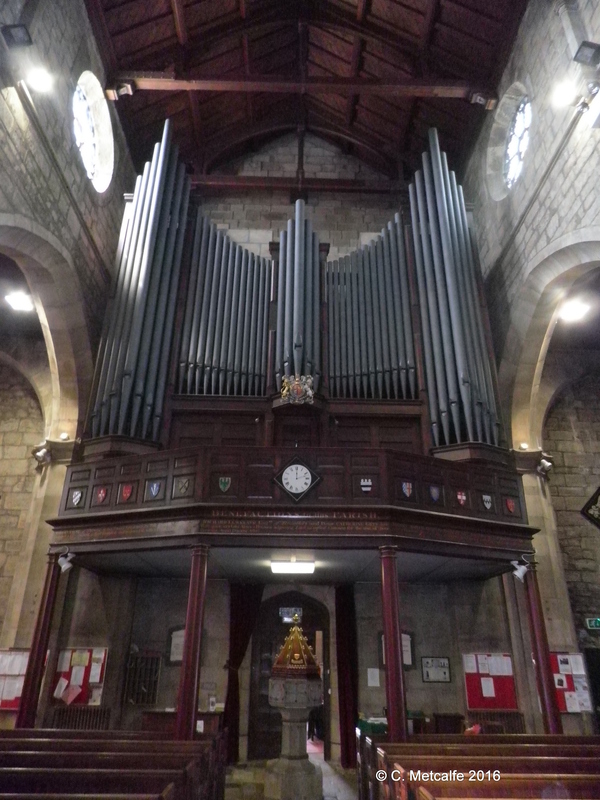 In 1883, an organ made by Walker & Sons, London, was given to St Swithun’s by the Society of St Margaret, when they, themselves, were given a new one. After money was spent to enlarge and complete it, this organ replaced the older one, which was sold to the Brighton Workhouse for £25. 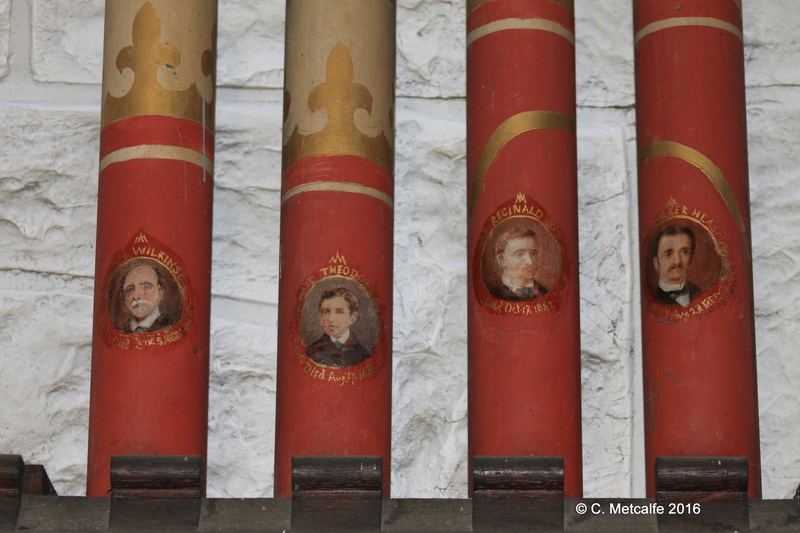 The Rev’d Douglas Blakiston decorated the pipes on the south and west fronts- presumably the pipes that showed. This organ would have been pumped by hand. Between 1935 and 1937, a new organ that incorporated some pipes from the existing organ was built by Morgan and Smith of Brighton. In the 1990s, restoration by F.H. Browne and Sons of Brighton modernised the organ. 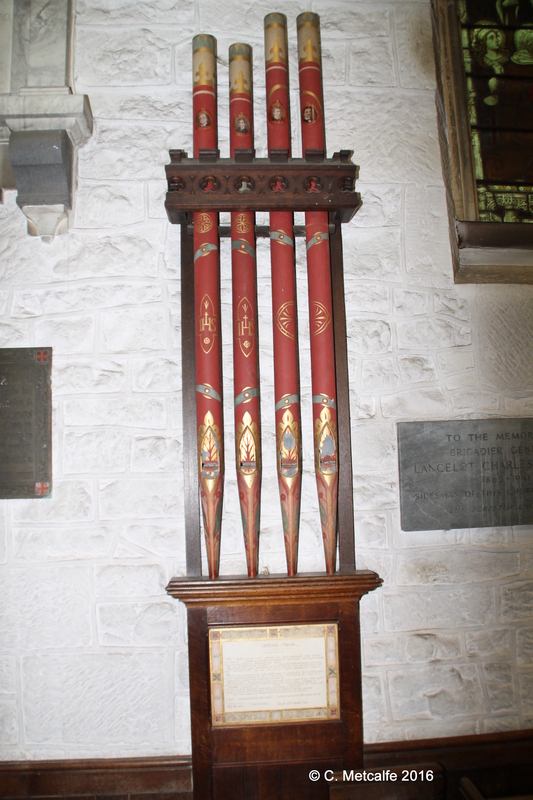 Four of the pipes decorated by the Rev’d Blakiston are mounted in the Chapel to the left of the main altar. 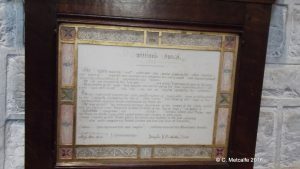 The plaque, transcribed above, used to be attached to the old organ. The console of the present organ is in this Chapel, but the removal of the pipes to the gallery in 1937 gave scope and space for the creation of the Chapel of the Nativity. The casing of the organ was apparently given in memory of the Misses Sophia, Edith and Bertha Groves. This brief outline of the organs in St Swithun’s suggests the generosity of parishioners, past and present, and the care taken to make something beautiful as well as functional, to enhance worship in the church.